OSB is an engineered wood-based panel material in which long strands of wood are bonded together with a synthetic resin adhesive. OSB is usually composed of three layers, with the strands of the outer two layers orientated in a particular direction, more often than not in the long direction of the panel. 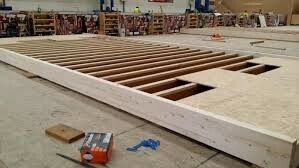 The timbers used in OSB manufacture include both softwoods (spruce, pine) and hardwood (aspen). Wood strands are cut tangentially from debarked logs which are held longitudinally against rotating knives. After drying, these flakes are generally sprayed with a synthetic resin binder and wax and then bonded under heat and pressure between steel belts. Because of its lay-up and composition, OSB is primarily a panel for construction and is widely used for flooring, flat roof decking and wall sheathing. OSB’s strength mainly comes from its uninterrupted wood fibre, interweaving of long strands and the degree of strand orientation in the surface layers. Waterproof and boil proof resin binders are combined with the strands to improve internal strength, rigidity and moisture resistance. OSB (Oriented Strand Board) is an engineered wood-based panel consisting of strands of wood which are bonded together with a synthetic resin; the strands are pressed together in layers. In the outer layers strands are generally oriented longitudinally in line with the panel length, whereas in the middle layers strands generally lie in a cross wise direction. Panel density (and thus panel mass) varies depending upon the product, being affected by the timber species and the manufacturing process. Typical densities are 600-680kg/m_. Thus, for example, a 2400 x 1200 x 12mm panel will weigh approximately 20 kg. Panel sizes commonly available are 2440mm x 1200mm, 2440mm x 1220mm and 2500mm x 1250mm in thicknesses of 6mm to 40mm. 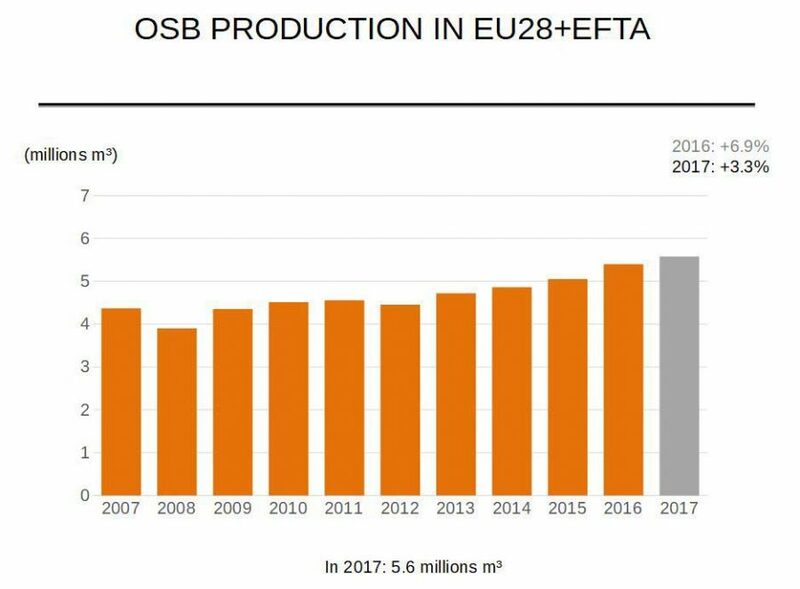 It will soon be a legal requirement to demonstrate that OSB used in construction satisfies the requirements of the European Construction Products Directive. This legal requirement is written into national building regulations. Manufacturers shall demonstrate compliance with the legal requirements by showing that their OSB complies with the harmonised standard EN 13986 “Wood-based panels for use in construction – Characteristics, evaluation of conformity and marking”. This standard should be published before the end of 2001. It calls up EN 300 “Oriented Strand Boards (OSB) – Definitions, classification and specifications”, which will have to be used when specifying OSB. OSB/1 – General purpose boards and boards for interior fitments (including furniture) for use in dry conditions. OSB/2 – Load-bearing boards for use in dry conditions. OSB/4 – Heavy-duty load-bearing boards for use in humid conditions. The threshold value requirements for specified mechanical properties of the 4 OSB grades in EN 300 can be summarised as indicated in the following tables. The values are 95 percentiles (5 percentile values in the case of swelling in thickness) and are characterised by a moisture content in the material corresponding to a relative humidity of 65% and a temperature of 20°C. This implies that these specified mechanical properties have to be controlled according to statistical principles and that 95% of the test values on individual samples have to exceed (or remain below in the case of swelling in thickness) the respective threshold value requirement in EN 300. Like other wood-based panel products, OSB is hygroscopic and its dimensions change in response to a change in humidity. A 1% change in moisture content increases or decreases the length, width and thickness of the different grades of OSB by the amounts set out in the table below. As a guide, OSB can be expected to attain the following moisture content levels under the following specified conditions. When components are factory produced for installation on site, it is essential that the site conditions are suitable to receive the components with wet trades completed and the building dried out. OSB with enhanced moisture resistance (OSB/3; OSB/4) is not waterproof; the term ‘moisture resistant’ applies to the adhesive binder which (within limits defined by EN 300) will not break down in the presence of moisture. 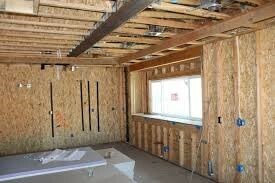 Physical wetting of all grades of OSB should be avoided. Typically OSB will not be attacked by wood-boring insects common in temperate climates. It can be used in hazard classes 1, 2 and 3 as defined in EN 335-1 “Durability of wood and wood-based products — Part 1: Definition of hazard classes of biological attack”. For these three hazard classes, the respective moisture content of OSB and the organisms that may attack OSB under the specified conditions are given in EN 335-3 “Durability of wood and wood-based products — Part 3: Application to wood-based panels”. The value of the water vapour resistance factor (m ) for OSB having a density of 650 kg/m_, can be taken as 30 using the ‘wet cup’ method and 50 when the ‘dry cup’ procedure is employed (EN 12524). The thermal conductivity (l ) of OSB is 0.13 W/m.K for a mean density of 650 kg/m_. Under the new Euroclass system for the reaction to fire of materials, untreated OSB with a density >600 kg/m_ and a thickness >10 mm will typically achieve a Euroclass D rating except when used as a laminate floor covering, or a Euroclass DFL rating when it constitutes a laminate floor covering and tested as a separately marketed product whether or not it is subsequently fixed to a flooring substrate. Careful storage and handling is important to maintain panels in their correct condition for use; thus, OSB must be protected from rain and accidental soaking. During transport, it is particularly important to keep edges well covered. Panels should be stored flat in an enclosed, dry building. When handling boards, the edges and corners should be protected against damage. OSB can be cut by a hand or power saw and machined (routed, spindled, planed and bored) with common woodworking machinery. Tungsten carbide cutting edges are recommended for use with powered tools. Wherever possible, fittings that depend upon face fixing should be selected; fittings that depend upon the expansion of a component inserted into the board edge should be avoided. Conventional woodworking fixings and techniques can be applied to OSB which provides good holding power for screw fixings into the board faces; generally, edge fixing is not recommended. Parallel core screws should be used because they have greater holding power than conventional wood screws. A high ratio of overall diameter to core diameter is desirable. Drill pilot holes for all screw fixings. Typically, the holes should be 85 to 90% of the screw core diameter. Fixings into the board face should not be within 8 mm of edges and 25 mm of the corners. Nails and staples can be used for lightly loaded fixings or to hold glued joints while the adhesive sets. The joint parts should be accurately machined. Use sharp cutters to avoid tearing or burnishing the surfaces to be bonded. Use a high solids content adhesive with low flowing properties such as polyvinyl acetate or urea formaldehyde. Locate mating pieces accurately and hold them under pressure while the adhesive sets. The width of grooves machined in OSB should be limited to about one-third of the thickness of the board. The depth of groove is typically about one-half of the board thickness. Allow adhesive-bonded joints to condition for several days before sanding and finishing; this avoids the appearance of sunken joints and is essential with high-gloss finishes. A tongue and groove joint is very efficient, provided the fit of the joints is not too tight to cause a split along the edge. Where smooth surfaces are required pre-sanded panels should be specified. OSB will generate dust when it is machined and this dust, like any other wood dust, is a potentially hazardous substance and must be controlled. There is no evidence that exposure produces health effects that are different in nature to those associated with exposure to similar levels of dust from other wood sources. Exposure Limit in the country of use. Exposure must be reduced as far as possible below this limit, usually with properly designed and maintained dust extraction equipment fitted to woodworking machines. Extraction equipment is often not practicable or even available when using portable or hand-held tools, so a suitable dust mask (for example, Type FFP2 to EN 149) should be worn. If possible, work in a well-ventilated place. Studies indicate that anyone machining OSB in mechanically ventilated situations is exposed to extremely low levels of free formaldehyde. Uncoated OSB manufactured using phenol formaldehyde or isocyanate resins does not require to be tested for formaldehyde and is automatically rated as E1. Uncoated panels produced in Europe generally achieve an E1 rating. The table below gives the most common hazards and identifies control methods to minimise the risk of harm actually occurring.